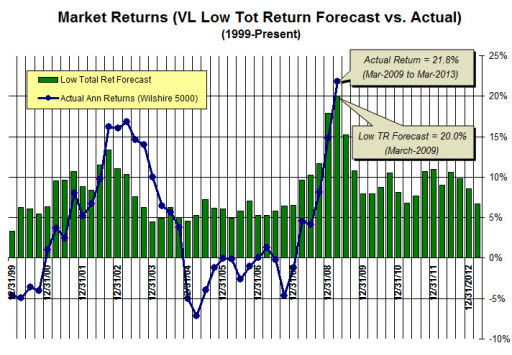 Just a refresher on the forecast vs. actual results for the Value Line Low Total Return Forecast (VLLTR) … a close cousin of Mark Hulbert’s VLMAP … and taking Mr. Hulbert up on his suggestion to benchmark versus the Wilshire 5000 (VTSMX). As shown here, even the Value Line LOW total return forecast has been fairly consistently 3-4 percentage points higher than actual results. And to reinforce, we consistently see alignment between VLLTR for individual companies and their projected annual return (PAR) at Manifest Investing. Why is this the case? We believe that the inclusion of analyst research from the likes of Morningstar and Standard & Poor’s moderately tempers the overall analysis. (We obviously include Value Line in the analysis of every company, too.) Time after time, we see slightly lower growth, profitability or projected P/E forecasts when we aggregate and combine — and find that collectively, this combined result aligns more closely with VLLTR and actual total return results over the last several years.